Surfing Is Officially An Olympic Sport, Now What? Surfers will represent their countries in the 2020 Games in Tokyo. So what’s next? The sport of kings has officially become an Olympic event. There is no more should or should not, it is. Surfing will be broadcast to hundreds of millions if not billions of televisions worldwide. Surfing will make its Olympic debut at the 2020 Games in Tokyo. And competitors will be comprised of 20 women, and 20 men from a smattering of different countries. Fernando Aguerre, President of the International Surfing Association, has been at the forefront of the push to include surfing in the Games. He is currently in Rio de Janeiro to witness the International Olympic Committee’s decision for himself. We caught up with Fernando to talk about emotions surrounding the official announcement, and next steps to ensure a successful presentation of surfing to the world in 2020. [Duke Kahanamoku] is our founding father. When there were maybe 20 surfers in the world, he was one of them. He just happened to be the most famous swimmer in the world, with an Olympic gold medal in 1912 and 1920. So, he asked the IOC to bring surfing in the Olympics, but of course, like most things you have to ask then you have to do something about it, and not much was done for 80 years. When I was elected president of the ISA, I looked at it as, if we really care about surfing we need to put together a plan­– you know I grew up in Argentina I know that in order to protect your sport you have to get together with other people that love your sport. When I was a teenager after finishing high school I had to go into the military. There was a mandatory draft for one year. And when I exited the draft there was a military dictatorship that took over the government, and they banned the sport of surfing in my city, the only city where there was surfing. So, I said, “What am I gonna do? I’m bad at soccer, and I’m bad at tennis. This is what I like.” So, with my brother, a couple friends, and with the support of my mother, we started an association. We started running contests promoting surfing, a sport that was prohibited by the military. So it was really a long shot that we were going to get the ban lifted. But, a year later we got it. So from that humble beginning in Argentina when I was younger – I did this when I was 20, I was in the first year of law school, in college – this is basically the same principle. You know, for the 2024 games, the frontrunners are LA and Paris. There are naturally occurring good waves in France and there are good waves in California. So, they might decide they don’t need a wave pool. But who knows? You know, between Kelly Slater, and Wave Garden, and some others that might come, in a couple years, we may three or four really good waves, you know, manmade waves, where actually the ISA or the WSL run one of their events, and suddenly we say, “Wow, great.” We’re not scoring your lack of getting bigger waves we’re scoring your performance on waves. So it will change how the competition will be held, and we may be able to have a little additional objectivity in certain criteria. So, we’re completely open to that. And so is the IOC. The IOC is very interested on this – on seeing what happens with the evolution of manmade waves. I think it wasn’t so much that they didn’t want it. It was that there was no facility that has hosted world championships, no facility that is a proven viable business model, and the IOC was not going to allow the building of a $30 million wave pool in Tokyo only to discover it’s too expensive to operate. 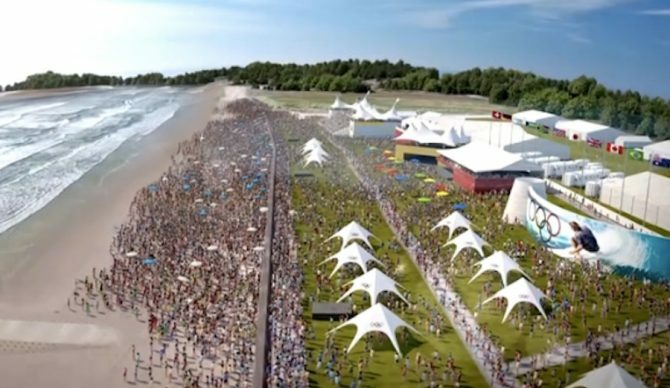 Surfing will take place on the beach with music and sponsor showcases. This rendering shows what the scene at Tokyo might look like. I’ve brought my whole family [to Rio]. You know, the hours that I told you that I’ve spent working on this are hours I didn’t spend with my wife, my kids, my friends. So, I’m asking everyone to come and join me there, including a group of close friends. This achievement belongs to all the people that helped me along in my 45 years of surfing, and my 35 years of promoting surfing. I just got inspired by the Duke. I know what surfing does. I mean you surf, I surf, we see 80-year-old people surfing and 3-year-old people surfing. It changes the way you feel about yourself. It’s like a zen. It’s like a temple. I just want to share that with other people around the world. You know, I go to Latin America, I go to Asia, I go to Africa, and I see the faces of kids who go to the water for the first time. They have like a beat up board made from the trunk of a tree shaped by their dad with a hatchet. And their face, and the stoke is the same that you and I have. So, I look at that and it’s like. You know if you ask me, “Fernando, why are you proud?” I’m proud because I’m like an ambassador of stoke. The most important part [moving forward] is the qualification system, which is how the surfers of the world will qualify for those 20 male and 20 female spots. That’s one thing. So that will be decided next year in coordination with the IOC and in consultation with the WSL and different organizations. Of course, the IOC wants the best of the best, and we are going to work hard, so our Tokyo participation, is not a one off, but the first of many to come. The IOC has two principles for Olympic qualification. They want to have the best athletes, which sometimes means the top professional stars. But they also want geographic universality, which means the widest amount of countries represented. So these are two principles. It’s not that they just want the best or just want geographic universality, they want both. So, you have to find a system that allows for the top WSL surfers to be able to participate, but also for the top African, Latin American, European, and Asian surfers to participate too. So it’s not going to be a copy of the ISA Championships. It’s not going to be a copy of the WSL. It’s going to be something else that leaves the door open, in an incluseve matter, for people that today you or I don’t know. In four years, a good surfer could become an excellent surfer if he has the resources, the skill, and the help. [The IOC] wants us to do the best we can. And we want to be the best we can. We want to be so successful that people will be talking about this for ages, and people are saying we need to have surfing in every Games. If you ask me, “What’s the ultimate goal?” That’s the ultimate goal. You don’t get a second chance to give a first impression. So this has to be a great first impression. Let’s say [surfing being dropped] is possible, but I don’t think it’s probable. Any sport could be dropped under the current IOC Charter. Even the most traditional sports could be dropped. It’s all changed. The rules have all changed. After each Games, all sports will be reevaluated to decide if they stay or go. Which, for me is great. I think surfing can pass that examination with high notes. And so can skateboarding, and sport climbing, and maybe a few other sports. You know, it’s just like snowboarding. Snowboarding was brought to the Winter Olympic Games in ’98 and it changed the Winter Games forever. It changed everything. The culture of the Winter Games changed. Everything changed. It changed skiing, the way skiing is practiced. The way skis are designed, everything. So as I said, we have a plan, then comes reality and we adapt the plan. Just like surfing. It closes out, you use the ramp. It doesn’t close out you ride it and do a nice cutback, wait for the reform. That’s the beauty of what we do. You don’t go surfing with a plan.